Some techniques and articles do not fit in any of the sections, so I created this section in which I collected them. I am writing here on practices that are not in the mainstream but nonetheless having their relevant and sometimes most important place in shamanhood. The first of these articles just is the most provocant to many readers. I am sharing my point of view on sexual union with energetic beings, poweranimals or angels, and the rare case of a spirit-marriage. It was previously part of the article on poweranimals and not elaborated at the beginning. During my revision of all articles the text became more detailed and informative. I am pretty sure that even this more detailed article still provokes misunderstandings and resentiments, but this time I hope on a higher, more practical base then before. The other two articles are describing two energetic "organs". The navelchord - or aka-cord, as it is named in huna - and the third eye are the two "organs" of import that I am describing in them. 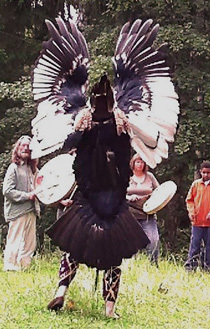 One article I have written is pointing to differences and similarities between lived contemporary and european shamanisms and traditional ceremonial magic, I prefer to name angel-magic. I am having my roots in traditional angel-magic and thus this is a topic I am engaged and interested in since really many years, actually since I started shamanizing in 1991. In the unlikely case that you are interested in my great and abundand abilities as teacher of these techniques I direct you to my workshops. In short: I do not teach in other languages then my own. So you should change your mind and find someone different in your vicinity. Currently I am preparing an english edition of my recently published german book on contemporary shamanhood, wherein I collected all articles of my website that deal with shamanic practice or the twilight (the non-ordinary reality). A little bit earlier I am going to publish the english version of the PDF, which has some other contents then the book. So you have to wait some time until your request can be met. As in each section I want you to notice: You should not practice the described methods, techniques and ideas when you are mentally of physically ill. You should have an intact psyche and a good physical health when practicing anything I describe here in detail. I do not take responsibilities for results or consequences that may manifest or not manifest when single individuals or groups try to conduct any of the techniques or methods described anywhere on my website! I consider it vital and quite important that you learn or practice these things under a skilled and competent teacher.